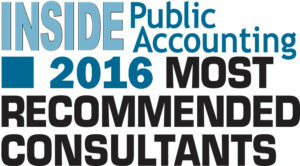 We are proud to announce the 2016 IPA Most Recommended Consultants, listed in alphabetical order, and their firms. The full list will be highlighted in the October issue of INSIDE Public Accounting. Each year INSIDE Public Accounting asks firms from across the nation in the IPA Annual Survey and Analysis of Firms to name one consultant, whom they have used during the past year. Congratulations to this group and IPA thanks this group for their hard work and dedication to the profession.